31 May '08 - I read two interesting articles this morning; one was about Kent State University in Ohio who is offering their custodial staff the option of working four 10-hour days a week instead of five 8-hour days so they can cut their commuting costs. The other article was about the possibility of blackouts in New Zealand this winter if huge power savings are not able to be made. Why not change the corporate workday to be 10 hours long? Employees could work 2 days, be off 1, work 2, be off 3 or else work 4 and be off 3. It would save commute time and fuel... How green are biofuels? What percent of existing cropland would be needed to produce enough fuel to meet 1/2 of US demand? Surprised?... The biggest consumers of alternative medicine are middle-aged, middle-class women. But they’re educated enough to know what they’re paying for and if they prefer to spend money on an aromatherapist than a stiff gin, it’s hard to cry too many tears for them. Since the average amount of time a patient can speak to a GP before interruption is 23 seconds, it’s easy to see why someone might find it worthwhile to bung 50 quid to a reflexologist just to chat for an hour. When you have a couple of anteaters as pets - what do you feed them?... "While the family dog may appear empathetic, no pet understands the difference between sorrow and pity." - Michael Gazzaniga on how humans are the result of a phase shift, and that's what makes them special. He thinks humans "dominate this universe"... Some worry about the unfair advantage and peer pressure that comes from cognitive enhancing drugs. However, millions suffer from untreated but mild memory loss. Is it fair to deny them help? If the shy or the scatterbrained take cognitive enhancers, it is not obvious whether this is levelling their playing field or giving them an unfair advantage. Is it “natural” to prop up the ageing body with a nip and a tuck, but to restrict help for the ageing mind to brain-training on the Nintendo?... "The computer becomes an indispensable component of any structure once it is so thoroughly integrated with the structure, so enmeshed in various vital substructures, that it can no longer be factored out without fatally impairing the whole structure. That is virtually a tautology. The utility of this tautology is that it can reawaken us to the possibility that some human actions, for example the introduction of computers into some complex human activities, may constitute an irreversible commitment" - Nicolas Carr (middle article)... "The influence of computers is hard to resist and even harder to escape," - Joseph Weizenbaum, creator of ELIZA. Location, location: In South Africa, for $500k you can purchase a genuine castle complete with armour, high security and a golf course. Stradford Castle, nestled beside a gorgeous lake, is engraved with words of wisdom from ancient dukes and has hand-crafted stained glass. Meanwhile, in San Francisco, for $500K you’ll afford a junior 1-bedroom with a spacious sleeping alcove. If you crane your neck out the bathroom window, you may even get a “peek-a-boo view” of the Bay Bridge... Quick! Which country produces the most movies? The most per capita? Which has the biggest average movie budget? (via Robot Wisdom Auxiliary)... Trailer for War, Inc., a political satire set in a country occupied by an American private corporation run by a former US VP; its CEO hires a hitman to assassinate a Middle Eastern oil minister. There are 630 corporations like Blackwater and Halliburton on the US government payroll in Iraq getting 40% of the more than $2 billion Washington spends every week on the occupation (but, oh, wait - that last part is out of real life). If you take what is known as "the most dangerous hiking trail in the world," you will not be mountain climbing - you will be using a public trail. It is located in Huashan (Mt Hua), which is one of the 5 sacred mountains in China. Nowhere are the cliffs more difficult to climb than the North Peak. There are places on this precipitous path where tourists can climb up only by pressing an ear close to the cliff... It's no surprise that animals that live under constant threat from predators are extra-cautious, while those that face fewer risks appear to be more reckless. After all, such successful survival strategies would evolve by natural selection. But individuals of the same species, living under the same conditions, vary in their degree of boldness or caution. In humans, such differences are called personality traits. From cowardly spiders and reckless salamanders to aggressive songbirds and fearless fish, animals are not characterless. These personality traits (humans', too) evolved to help individuals survive in a wider variety of ecological niches. The traits suited to living in a group of African nomadic hunter-gatherers would differ from those suited to living in the far north where one must spend the long winter nights cooped up in an igloo with the family... The US Forest Service has computed that for every dollar spent on the 117,000 street trees in Indianapolis, the city receives a $6.09 benefit - a 500% return which includes energy conservation, storm water reduction, cleaner air and improved property values. More than half the black bears that live in the Ocala National Forest suffer from a type of mange, causing their hair to fall out. 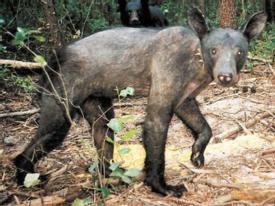 The mange is linked to mites that attack the bear's skin. This article actually appeared in 2002, so I don't know if it's still true or not. I've included it here because I didn't know bears looked like that under their fur... Bogart's penchant for alcohol was awesome. He once said: "I don't trust anyone who doesn't drink." One story has Bogart losing his way home after an all-night drinking session. Finding himself in an unfamiliar Hollywood suburb as dawn rose, he spied a woman cooking breakfast in a house and peered in through the window. "My God," she cried out to her husband. "It's Humphrey Bogart!" "What about him?" her husband shouted back. "He's in our front yard." "Well, invite him in." Bogart sat down for breakfast with the couple and their children, wolfing down bacon and eggs while mesmerising them with tales of Hollywood... See if you can determine how this visual effect is done before reading the comments section - I'm going with the second explanation as the correct one (via J-Walk Blog). Barcodes as art... The critical technology, for the early phase of the industrial revolution, was gin. The transformation from rural to urban life was so sudden, and so wrenching, that the only thing society could do to manage was to drink itself into a stupor for a generation. They finally realised that they had a vast civic surplus, one they could design for rather than just dissipate. Soon, there were public libraries and museums, increasingly broad education for children and elected leaders. We live in another stressful era with rising GDP per capita, rising educational attainment, rising life expectancy and, critically, a rising number of people working only 5 days per week. They have free time! Rather than drinking gin, most people coped by watching tv. What else might they do? If you take Wikipedia as a unit of measure, all of Wikipedia - every page, every edit, every talk page, every line of code in every language that Wikipedia exists in - that represents approximately 100 million hours of human thought. Assume for a moment that people watch only 99% as much television as they are accustomed to watch, leaving 1% for doing something else - producing and sharing. The Internet-connected population watches roughly a trillion hours of tv a year. 1% of that would allow the participants to create about 10,000 Wikipedia projects per year in that freed-up time. An architecture of participation can transform society. (from Here Comes Everybody by Clay Shirky via John August)... Earth and the moon as seen from Mars - a view I'd like to have some day. A 28-year-old fine arts master’s degree art student, Kittiwat Unarrom, lives in the Thai province of Ratchaburi, 62 miles west of the capital Bangkok. He bakes bread that looks like bloody body parts - and finds that business is booming. He himself is a Buddhist who dismisses the importance of outward appearances. (YouTube video)... There is one wonderful thing about the dead people that were raised — we do not hear of them any more. What became of them? If there was a man in this city who had been raised from the dead, I would go to see him tonight. I would say, “Where were you when you got the notice to come back? What kind of a country is it? What kind of opening there for a young man? How did you like it? Did you meet there the friends you had lost? Is there a world without death, without pain, without a tear? Is there a land without a grave, and where good-bye is never heard? Nobody ever paid the slightest attention to the dead who had been raised. They did not even excite interest when they died the second time. Nobody said, “Why, that man is not afraid. He has been there once. He has walked through the valley of the shadow.” Not a word. They pass quietly away. I do not believe these miracles. There is something wrong somewhere about that business. I may suffer eternal punishment for all this, but I cannot, I do not, believe. - Robert Green Ingersoll Orthodoxy (1884) via Cynical-C.
Portland, Oregon, where it rarely snows, is 130 miles farther north than Toronto, and over 200 miles farther north than Boston. On France’s southern Mediterranean coast, Cannes is 10 miles farther north than Milwaukee, Wisconsin. Madrid, with blazing hot summers, is 10 miles farther north than Salt Lake City. Tehran is located on the exact same latitude as Tokyo. India's northern border is the same latitude as Tijuana; the southern border is about the same as the southern border of Panama. Rome is at the exact same latitude as Chicago. Buenos Aires, Los Angeles, Cape Town, and Sydney are all almost identical distances from the equator. So are San Francisco and Melbourne. Estcourt Station, pop. 4, is the northernmost tip of Maine. London is 300 miles farther north. The 49th parallel, the long, straight US/Canada border in the west, is 120 miles north of Estcourt Station. Glasgow is 280 miles north of London. 250 miles north of that is Stockholm, 370 miles north reaches Reykjavik; 413 miles north is Hammerfest, Norway - almost 5,000 miles north of the equator. The entire country of England, with over 50 million residents, is smaller than the state of Louisiana. England, Wales, Scotland, and Northern Ireland together are smaller than Michigan. France is about 30% larger than California. Florida and Canada's Hudson Bay are getting about 1 inch closer every 36 years. Oscar the Naked Cockatoo was diagnosed with beak-and-feather disease — a virus highly contagious to other birds — and given 6 months to live. That was 12 years ago... Contrast that distinctively American method of electing some judges with the path to the bench of Jean-Marc Baissus, a judge on the Tribunal de Grand Instance, a district court in Toulouse, France. He recalls the 4-day written test he had to pass in 1984 to enter the 27-month training program at the École Nationale de la Magistrature, the elite academy in Bordeaux that trains judges in France. “It gives you nightmares for years afterwards,” Judge Baissus said of the test (open to people who already have a law degree) and the oral examinations that follows it. In some years, as few as 5% of applicants survive. On the other hand, elected judges serve their constituents. In particular, when the defendant is an out-of-state corporation, awards are much higher in states that use partisan elections to select their judges than in other states. As one judge put it bluntly: "As long as I am allowed to redistribute wealth from out-of-state companies to injured in-state plaintiffs, I shall continue to do so. Not only is my sleep enhanced when I give someone's else money away, but so is my job security, because the in-state plaintiffs, their families, and their friends will re-elect me." I have to wonder, really, if this differs so much from electing a president - one who is biased to favour the "constituents" that provide the money to finance a winning campaign. The elected judge and the elected president may both want to do a good job - it's just that all parties concerned don't agree as to what constitutes a good job - and compromises must always be made... "Call me Cherie," Mrs Blair told the Princess Royal. "Let's not," said Her Royal Highness; "I wasn't brought up that way." - Speaking for Myself by Cherie Booth Blair. More creative business cards (my favourite, for a hairdresser, shown left)... A $1 billion copyright infringement lawsuit challenging YouTube's ability to keep copyrighted material off its popular video-sharing site threatens how hundreds of millions of people exchange all kinds of information on the Internet, YouTube owner Google Inc has said. The plaintiff, Viacom, says YouTube consistently allows unauthorised copies of popular television programming and movies to be posted on its website and viewed tens of thousands of times. In fact, "the availability on the YouTube site of a vast library of the copyrighted works of plaintiffs and others is the cornerstone of [the] defendants' business plan". (How strongly is your opinion on this matter held?)... As it happens, there are no federal regulations in the US on the amount of UV light that sunglasses have to block, and while many cheap pairs do just fine, many don’t, and exploit the lack of sanctions to lie about it. If a producer of sunglasses is found to be producing a product that they claim blocks 100% of UV rays and it’s not, their punishment will be a nasty letter from the FDA. If they wish to avoid even that unpleasantness, they can simply label the accessory as “blocks most UV rays” and it will be subject to no regulation at all. (Being closer to the ozone hole, standards in Australia and NZ are quite high). The term CHDK refers to software – currently available free for many (but not all) Canon PowerShot compact digital cameras – that you can load onto your camera's memory card to give your camera greatly enhanced capabilities. To do this, it makes use of the microprocessor that controls the camera to act as a programmable computer. For example, a camera can be programmed to take multiple pictures for focus bracketing, or take a picture when it detects that something in the field of view moves or changes brightness. Here are some impressive examples of its use by Andrew Coutts (via J-Walk Blog)... The Socratic dialogue is a particular way of developing thinking skills through cooperative dialogue where significant human ideas and values are discussed. By participating in Socratic seminars regularly every other week, preschool children and even older students develop their thinking skills. Seminars address literature and works of art, with questions ranging from "Is Pippi Longstocking a good friend? "; "Is Jack stupid or smart when he sells his mother’s cow for some beans? "; or "Are we born good or evil?" In the beginning students may have difficulty expressing thoughts, but with time the ability to express themselves and to examine ideas critically and logically develops... This site has a website grade of 75/100; it has 1,530 pages indexed by Google, 25,980 inbound links and a traffic rank of 93,845 (okay, that's mediocre, but I don't let it bother me). Scientists chose the parameters of the fictional temblor such as its size and length of rupture and ran computer models to simulate ground movement. Engineers calculated the effects of shaking on freeways, buildings, pipelines and other infrastructure. Risk analysts used the data to estimate casualties and damages. The scenario focused on the San Andreas Fault, specifically its southernmost segment, which has not popped since 1690. The first thing that happens is that the Interstates begin breaking apart - it's downhill from there. The photo at left (larger image) shows the aftermath of the 1906 San Francisco earthquake. What surprises me is the amount of rubble in the middle of a broad street. I had mistakenly assumed that a person would be safe in the outdoors - as long as you weren't where a building would fall ON you. But I now see that severe shaking must launch rubble missiles, so few places could be guaranteed safe. (Does this mean I'd consider moving out of Wellington? Categorically, "no")... 12 parking lots across Santa Barbara have been set up to accommodate the growing middle-class homeless - part of the 1st program of its kind in the US. Lots open at 7pm and close at 7am. It's illegal for people in California to sleep in cars on streets, so a homeless outreach organisation works with the city to allow parking lots as safe places for the homeless to sleep in their vehicles without harassment by either pedestrians or police. Which way around the world? If you go around the world west to east then you lose an hour for each timeline you cross. Let’s say you fly from Brazil to Portugal - your flight might leave in the morning and arrive in Lisbon late in the evening, but thanks to the time zone thing you’ve lost 3 hours. So landing at 9pm really means landing at midnight. If you instead go around the world from east to west, the trip from Lisbon to Rio de Janeiro would be your last trip leg, not your first. The flight will still take around 9 hours, but this time, only 6 hours will have elapsed. Your body will be tired, but at least establishments will be open when you arrive. You lose a whole day east to west when you cross the international date line, but who cares? At least your sleep isn't so disrupted along the way... Mandatory jail time and heavy fines are not effective deterrents against drink driving. Far more effective are immediate license revocations. If it happens quickly, and happens to everyone who's busted, revocation can be a serious deterrent. If you're arrested for a DUI, and a year later you end up getting a $1,000 fine and a weekend in jail, that's a lot less effective as a deterrent than sitting on the roadside at 2am, watching as they tow away your car. The point of long jail sentences and fat fines isn't deterrence — it's punishment. If a driver endangers the lives of others, then justice demands penalty - but whether it's the most effective preventive tool is a more open question. (Frankly, I didn't care much for the rest of this article, but I liked that one idea)... Insurance companies calculate that to make a treatment worth its cost, it must guarantee 1 year of "quality life" for $50,000 or less. New research argues that that figure is far too low - economists have demonstrated that the average value of a year of quality human life is actually closer to $129,000. President Bush at the end of April signed into law a bill which, within 6 months, sees the federal government screening the DNA of all newborn babies, a move critics have described as the first step toward establishing a national DNA database. It does not require consent; described as a "national contingency plan," the justification for new law S. 1858 is that it prepares for any sort of "public health emergency." It represents the 1st population-wide genetic testing via a surveillance system for tracking the health status of individuals diagnosed at birth with genetic defects. (Oh dear. I'm afraid this may not be going down any road I'd like to be travelling)... More than 100 countries attending a conference in Dublin formally adopted a treaty to ban cluster bombs - a large, unreliable and inaccurate weapon that often affects civilians long after the end of armed conflict. The countries agreed never to use cluster munitions or the explosive bomblets they contain and never to develop, acquire, retain or transfer cluster munitions. Some of the biggest makers and users of cluster bombs - the US, Russia, China and Israel - were not involved in the talks and did not sign the accord. Organisers expressed hope that those nations would be pressured into compliance. Deep beneath the Atlantic Ocean, forgotten for the best part of a century, lies a tunnel linking London and New York, built on the whim of a Victorian inventor. Using state-of-the-art technology, the tunnel entrances have been reopened beside Tower Bridge in London and Brooklyn Bridge in New York. Now, you can stand on the South Bank of the UK end and see someone standing 3,460 miles away across the water... More than 1/2 of all insured Americans - children and adults - take prescription medicines regularly for chronic health problems. (Americans buy much more medicine per person than any other country.) The most widely used drugs lower high blood pressure and cholesterol. This reflects worsening public health as well as better medicines for chronic conditions - and aggressive marketing to consumers by drug companies. Insurance companies can negotiate better deals with health care providers than the uninsured are able to get. (So the uninsured end up subsidising the insured?) "Honestly," said one chief medical officer, "a lot of it is related to obesity - it's easier to pop a pill than exercise"... Worldwide, there are between 850,000 and 1 million suicides each year. The northern Netherlands produce more than 9 million tulip bulbs and 3 billion tulips a year. A fly-over in the middle of the season looks something like a child's paintbox. Bulbs are planted in late October/early November and harvested in May... At any given moment, about half of the world's poor are suffering from waterborne disease, of which over 6,000 - mainly children - die each day by consuming unsafe drinking water. (More than a billion people in the world do not have access to safe drinking water.) The average distance that women in Africa and Asia walk to collect water is 6 km. LifeStraw® Personal is a portable water purifier for prevention of common diarrhœal disease; it can be carried around for easy access to safe and clean drinking water, requires no electrical power or spare parts, and is easy to mass-distribute (via J-Walk Blog)... Around 372 million pages, or about 12%, of all web pages are pornographic... Looking for the best recovery drink after exercise? A study showed that cyclists who drank chocolate milk after riding to failure were able to ride next time 50% longer than cyclists who drank Gatorade or Endurox... 3.8 million Americans weigh over 300 pounds. 400,000 Americans, mostly men, weigh 400 pounds or more. Electronic tattoo: a subcutaneously implanted touch-screen operates as a cell phone display, with the potential for video visible just under the skin. It's inserted through a small incision as a tightly rolled tube; it unfurls beneath the skin, aligning between skin and muscle. Through the same incision, two small device tubes attach to an artery and vein to allow blood to flow to a coin-sized fuel cell that converts glucose and oxygen in blood to electricity... It isn't difficult to imagine what happens to prices when the world's two most populous countries buy up food products in an aggressive fashion. In more and more dangerously poor countries, wheat and meat have become an almost unaffordable luxury, while famine and hunger riots are only likely to get worse. London-based author Raj Patel, whose new book Stuffed and Starved takes a critical look at the global food industry, warns that the events in Haiti are "a sign of things to come"... Our perception of cocktails is affected by the shape of the glass - people do not enjoy drinks as much if they are served in a container they feel is inappropriate. The appearance of a drink can also affect how happy we are with it: our brains make a pleasant association between the colours of ripening fruit and increased sugar content. Such colours, particularly bright reds, are especially powerful visual cues. When incorporated into a drink, they can dramatically change the perceived flavour, as well as increase the perceived sweetness by as much as 12%. French researchers tested this by using an odourless dye to colour white wine red. The wine tasters who tried the result used typical red wine descriptors, suggesting that its colour played a significant role in how they thought of it. The first digital camera appeared in 1975. It was the size of a toaster and weighed 8 pounds. It took 23 seconds to record an image on cassette tape and about that much longer to read it back and display the image onscreen. (My but we've come a long way since then!) via Arts & Letters Daily... A $175 hamburger prepared with foie gras is available at The Wall Street Burger Shoppe in New York. The burger shop raised its price from $150 to assure its designation as the most expensive burger in the city as determined by Pocket Change, an online newsletter about the most expensive things in New York and Los Angeles (so maybe no one has ever bought one at that price?)... The USDA is no longer keeping track of pesticide use. Formerly, they published an annual report on chemical usage in agriculture. It was the only comprehensive, reliable source of information regarding national agricultural use of pesticides. Last year, ostensibly because of budget cuts, the USDA scaled back the surveys to cover only a few crops. Then early this year, in a cryptic notice published deep in the Federal Register, the agency announced that all chemical-use surveys would be suspended until at least 2010. In other words, the government will no longer be keeping track of what kinds of pesticides are used on US crops, nor how much.